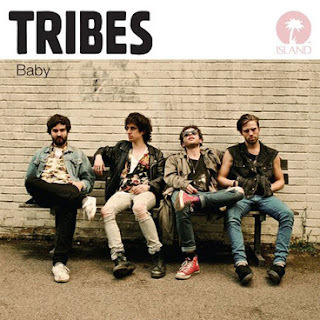 Tribes debut album Baby has been an album that I have not been able to stop listening to ever since I first heard it. Even before the albums release when the band delivered the We Were Children EP, their sound was an instant gratification for me. The full album debut Baby did not disappoint as it started off with 'Whenever' and delivers a perfect mix of guitar riffs and vocals. Tribes are a British band that return the favor and bring guitar rock back front and center. Next up is 'We Were Children' and is a song that has been floating around since the bands original EP. It starts out with a sweet guitar intro and is followed up by some massive lyrics. Just a solid all around rock n' roll song that entices the mind. 'Corner Of a English Field' is the bands newest single and has a great melody from start to finish. One of the slower tunes from the album. They just keep coming with good song followed by good song, and just goes on to create such a solid all around album. 'Half Way Home' continues on the pace that 'Corner of a English Field' brings. Leadman, Johnny Lloyd's vocals are outstanding throughout the entire album and really bring it together on songs like this. 'Sappho' is another one of the older songs, it is filled with a high energy vibe. These guys do a great job at making their songs work and creating an album atmosphere that makes you want to listen to the entire album. Next is 'Himalaya' and it is a good slow song with some emotional lyrics and some guitar sounds that resemble something I use to hear from Radiohead back in The Bends days. The album closes with 'Bad Apple' and it is a simple closing song. Just like the rest of the album the vocals and guitars make the song what it is. Tribes have the ability to make some sweet melodies and at the same time can really rock a song out. With the release o their debut album Baby, they have entered into The Vaccines territory and show no signs of slowing down. Baby is by far my favorite album of 2012 so far and I think any album would be hard pressed to move it out of the top of my list even though we are only in March. Finding a British rock album that works as well as Baby is a hard to do. The album showcases some guitar riffs and sounds that are very new and fresh. The drums, guitars, and Lloyd's vocals all work perfectly together. The appealing part of Tribes for me is their sound, it is somewhat of a Radiohead (The Bends) meets Brandon Flowers (The Killers), with the modern day The Vaccines in the mix. There is not a dull song on the entire album, and it really is an album worth hitting the repeat button over and over again.